Based on Joe Kelly and Ken Niimura’s popular graphic novel of the same name, I Kill Giants is the story of Barbara Thorson (Madison Wolfe), a teenaged outsider who escapes from relentless bullying at school and problems at home by immersing herself in an elaborate fantasy world. Barbara behaves oddly, often wears a pair of bunny ears, and doesn’t make friends easily, save for a new girl (Sydney Wade) who starts reaching out to her. She prefers to spend her time setting traps for giants, and sees herself as the protector of her small town from monstrous forces, using this as a way to cope with her mother’s ailing health. But this makes life even harder for her older sister Karen (Imogen Poots), who is acting as her caregiver, and her odd behaviour also quickly gains her the attention of the school shrink Mrs. Mollé (Zoe Saldana), separating her even more from the other girls. Though as the film progresses, the question becomes whether Barbara’s delusions are helping her better navigate the real world, putting her even further out of touch from it, or if the giants in her mind are actually real. The feature directorial debut of Anders Walters, I Kill Giants is a fine fable for older kids that uses the fantasical elements of its story to deal with some pretty heavy themes of bullying, confronting a parent’s death, and how the grieving process affects a child who is already neurologically different. No, the film isn’t as strong as the 2016 standout A Monster Calls or the underrated 2007 film adaptation of Bridge to Terebithia, to which it shares many thematic and stylistic similarities. The script’s dialogue is also sometimes a little too on the nose, clearly being crafted for younger audiences. But I Kill Giants is still a fairly engaging and emotional live action fairy tale, that features solid special effects for something done on a limited budget, and is carried by a fine performance from its young star Madison Wolfe. It’s being released straight to video after having its world premiere at TIFF last year, and it’s worth checking out, especially for fans of the graphic novel. The Blu-ray also includes the short featurette Anatomy of a Scene, which shows how they filmed one of the big special effects sequences using green screens on a soundstage. 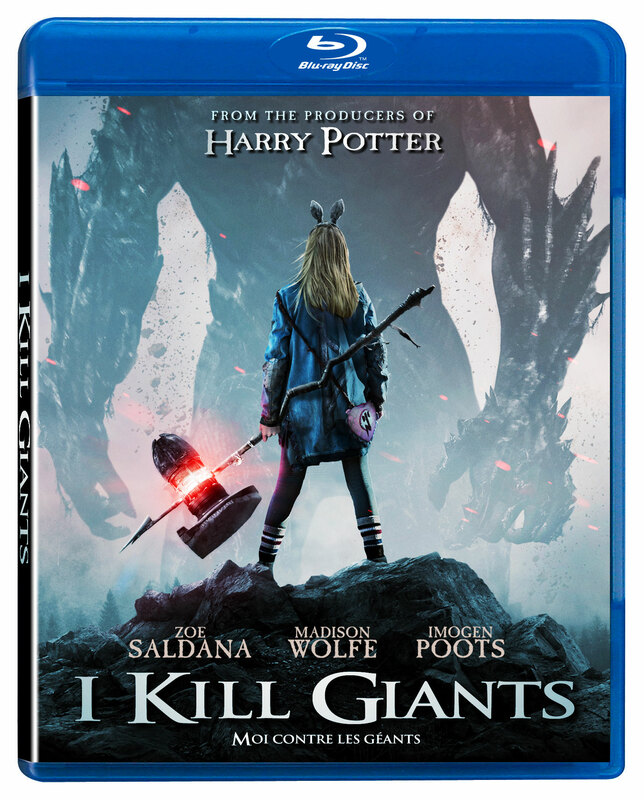 I Kill Giants is a VVS Films release. It’s 106 minutes and rated PG.